These cuddly, furry pets seem like they would naturally go well together, but they should never be mixed. 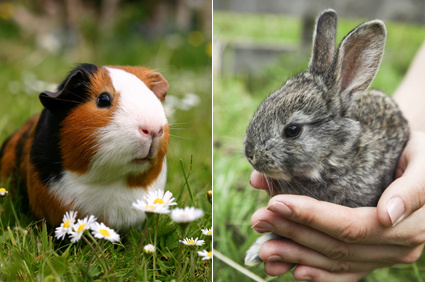 Both species may be cute pocket pets, but each carries a type of bacteria in its respiratory tract that may be harmless to the species carrying it but can cause serious, potentially life-threatening infection in the other species. Many exotic pet owners tell me how their lizards and turtles like to hang out in the same rooms with their bunnies, rodents, hedgehogs, sugar gliders and birds. One owner actually told me that her tiny gecko liked to sit next to her large rabbit on the couch and watch TV! While those animals may seem to get along just fine, reptiles carry salmonella in their intestinal tracts and shed the bacteria into their stool. While the bacteria may not bother the reptile, it can cause serious gastrointestinal upset and potentially sepsis (infection of the blood) in mammal species in which it is not usually present. Consequently, reptiles should never be allowed around mammals that might pick up the bacteria on their feet and ingest it if they are exposed to areas where a reptile has defecated. Humans, too, can become infected with salmonella after handling a reptile. That’s why it’s essential to wash your hands after any reptile exposure. Finally, birds and small mammals are potential prey for many reptiles, including snakes — so, again, not such a good idea to let them mingle.